Critique is vital to the creation of artwork. While we are creating, we are constantly assessing, thinking, revising, formulating, and changing. We are in a near-constant state of critique. Yet, we don’t always learn as much from self-critique as the opinion available is our own. Regardless of whether or not we heed it, receiving feedback from others provides another voice in the void; it provides contrast, it provides confidence, it provides perspective. 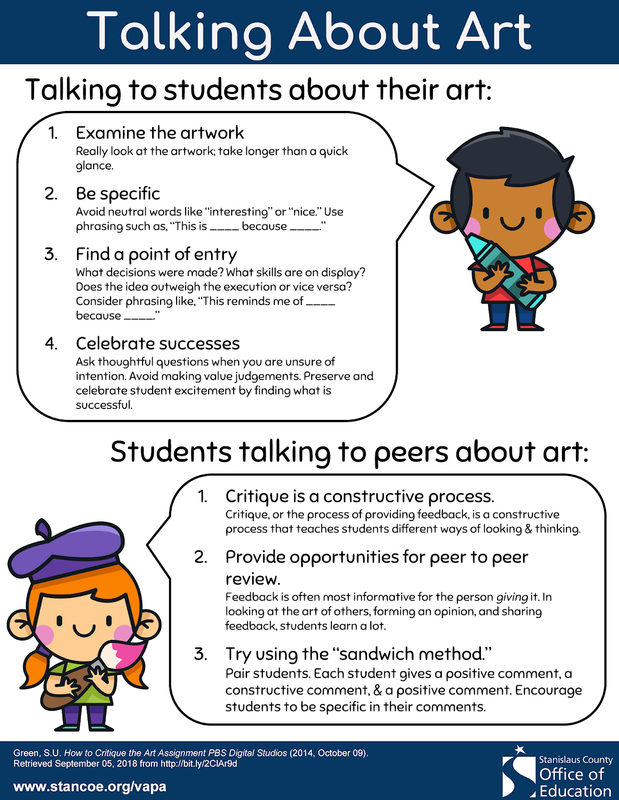 Critique, review, or peer review is a familiar part of any successful high school or college-level art course. Critique, however, is less seen at the middle and elementary school levels. Why is that? I think it is partly due to the age of the students, and a popular but completely unscientific belief that to critique young students’ artworks is somehow scarring and/or may take joy away from their art-making. Nothing could be further from the truth. Consider critique for high school students: Teachers set out guidelines for the process, and define behavior expectations. This careful planning ensures a valuable critique and helps keep things positive, supportive, and polite. This same planning can be applied, in an age-appropriate manner, to elementary and middle school classrooms. In the book Interpreting Art: Reflecting, Wondering, and Responding Terry Barrett states, “Self-knowledge can come through interpreting works of art, those that we are drawn to, and those that repel us.” The strongest value of a critique is not for the person receiving it, but for the person giving it. Think of the last strongly worded comment you made on social media (it was most likely in response to something). Did the person heed your advice? Did you expect the person to change his or her mind? OR, did you learn a lot more about the topic because you were reflective and thinking deeply as you wrote your comment? It is the same for students. When students observe, draw conclusions, form statements, and provide feedback they are DEEPLY engaging their brains in the topic. They have to understand the question, observe an artwork, form a statement with supporting evidence, and synthesize all of that to provide thoughtful feedback. Whoa! That’s the kind of learning we strive for, right?! Next time you have an “extra” five minutes with students and you don’t know what to do, consider utilizing that time for a bit of informal critique. You’ll be impressed with the insights of your students, and it will challenge you to develop even more rigorous learning experiences. The thoughts expressed in this blog post are my own and do not reflect Stanislaus COE.